We got our groove on with the bathroom. Well, for thirty minutes or so anyways. 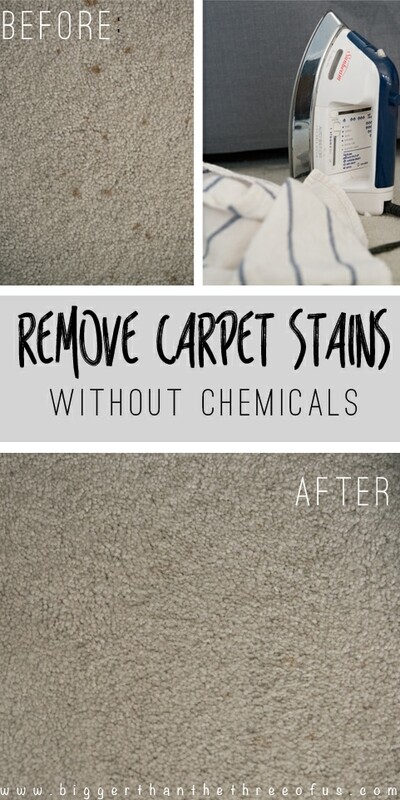 Seriously, don’t you just love short, cheap, projects that don’t require “messy clothes” and yield great results? I need more of those kinds of projects in my life. This project totally fit the bill and it turned out great. 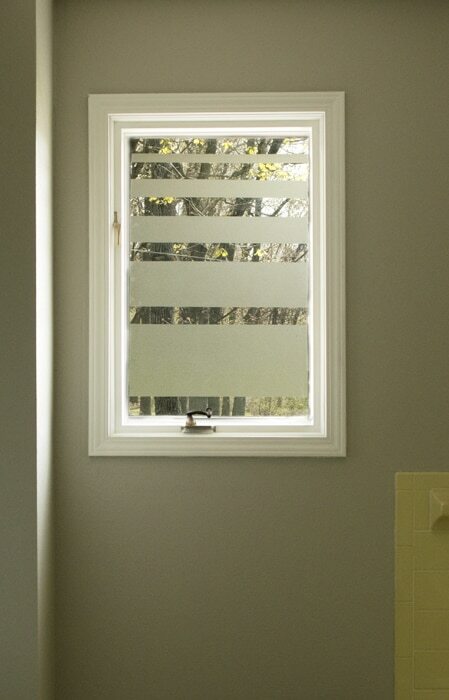 Here’s a cheap and easy way to Add Privacy to Bathroom Windows! When I first did our mood board for the bathroom, I planned on making a roman shade out of fabric. Once we got the lights installed in the right spots, we realized that the lights and wall color made the room pretty dark. 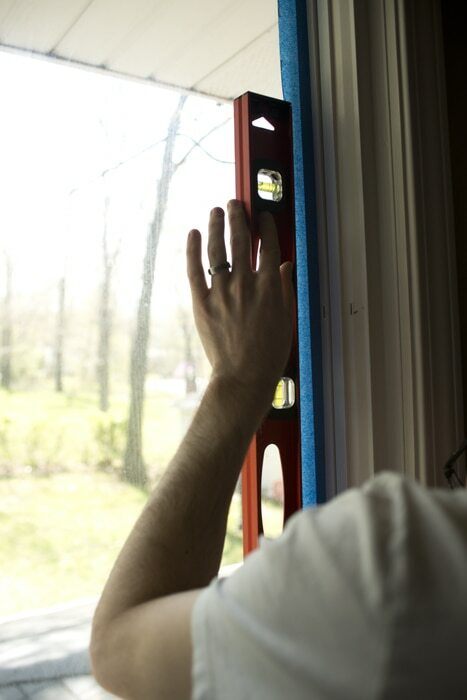 That sent us back to the drawing board for a window treatment. Our backyard is pretty big and the family behind (and to the left) have a pretty large lot, so privacy is not a huge issue. I wanted something on the window to make it feel a little more private though. So, I decided to try a contact paper window cling. I had tried it before in our master bathroom, but the results weren’t terrific. I was by myself trying to put it up and I ended up with air bubbles. So, I knew that I needed Luke to help out with this one. I let him decide on the design. 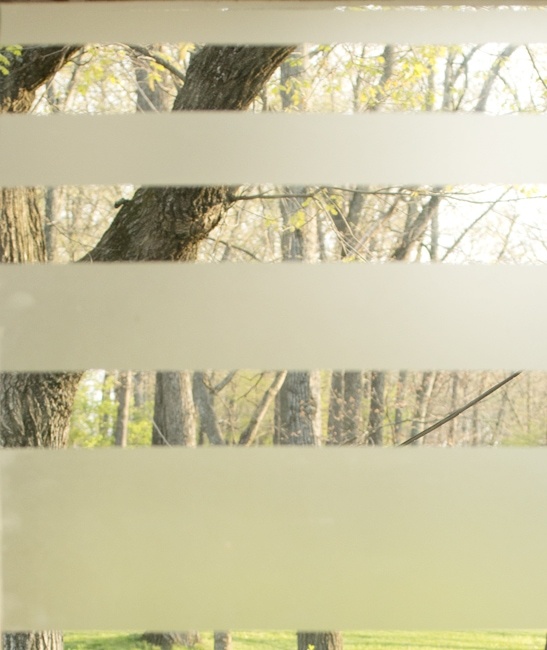 He went with gaps about 2″ apart and used the Fibonocci Sequence for the width of the stripes. Have you heard of that? Me neither. It’s the price I pay for marrying a programmer. I pulled the backing off while he slowly smoothed the air bubbles out. 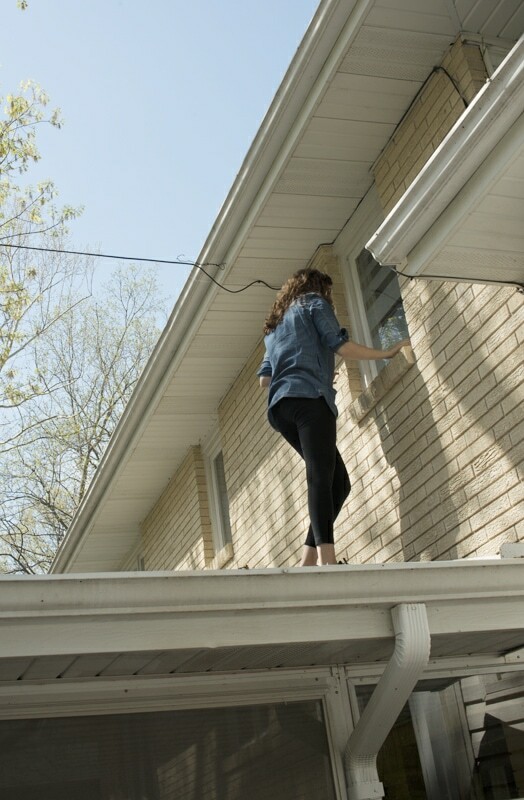 After getting it up, I realized that the window needed to be cleaned from the outside. Luckily, I only had to climb up on the lower roofline to reach it. ***Added 05/08: We just completed this project AGAIN in our master bathroom. 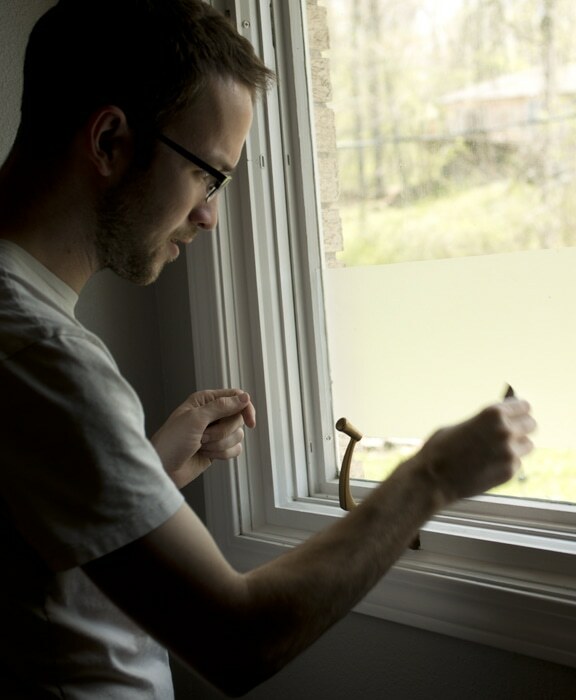 If you want a video tutorial for this window privacy treatment, then check out my Bathroom Window Privacy DIY! We already had the contact paper on hand, so it ended up being free. I think the contact paper runs about $10 at Staples if you had to buy it. The change is fabulous! It’s totally one of those things that looks 1000x better in person. 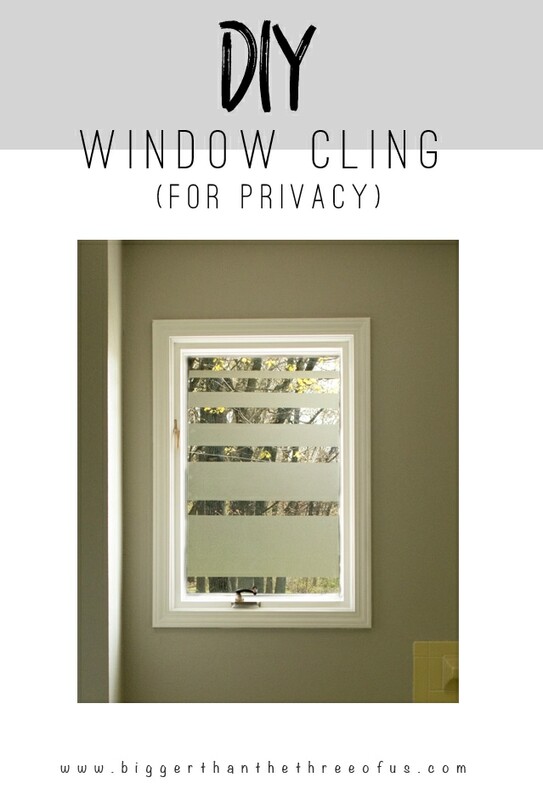 Pin For Later: Add Privacy to Bathroom Windows with this DIY! Affiliate links below. Thanks for supporting this blog. Click to read my disclosure policy.